The CW is celebrating Black Lightning’s all-new season with The CW Black Lightning Powered Up Sweepstakes. Visit blacklightningsweepstakes.com now through November 30 for your chance to win a Sony 55” 4K LED TV, Sony Ultra HD Blu-Ray Player, and Black Lightning Season 1 Blu-ray. 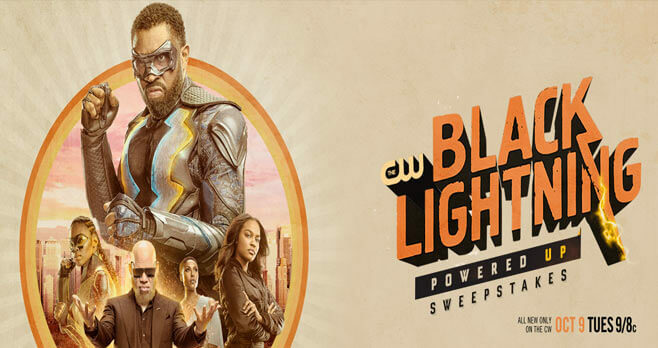 The CW Black Lightning Powered Up Sweepstakes is open to legal residents of the 50 United States or the District of Columbia and must be 18 years of age or older and of the age of majority in their state of residence as of the date of entry. The Sweepstakes begins at 12:00 AM PT October 8, 2018 and ends at 11:59 PM PT November 30, 2018. Limit one (1) entry per person and/or per email address, per day. The grand prize consists of a Sony 55” 4K LED TV, Sony Ultra HD Blu-Ray Player, and Black Lightning Season 1 Blu-ray. Visit www.blacklightningsweepstakes.com to enter and see Official Rules for details.